Does this make me Sandra Lee? 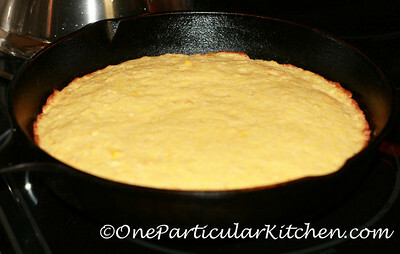 My in-laws were in town and I wanted to make some cornbread to go with the tortilla soup. The Yankee likes his cornbread total Southern style, no foolin’ around with it. So, in the names of convenience and experimentation, and inspired by a recipe a friend sent me. Half a can of diced pineapple (it’s what I had on hand) that I buzzed around in the food processor a bit till it was more like crushed pineapple. Naturally, I baked it in a cast iron skillet, according to Jiffy package directions. It was great! The corn made it so, so, so moist (that’s right, I said moist), and the pineapple made it a little sweet. Yum! My in-laws declared it a two-thumbs-up dish, and The Yankee didn’t have to see his cornbread fooled around with. A win!